In 1907 a man named J.M. Couch was camping near the town of New Idria, California in the Diablo mountain range. When he woke up, the morning sunlight was bouncing off of thousands of sparkling blue crystals. Thinking he had found an important deposit of gems, he took samples to some jewelers for identification. 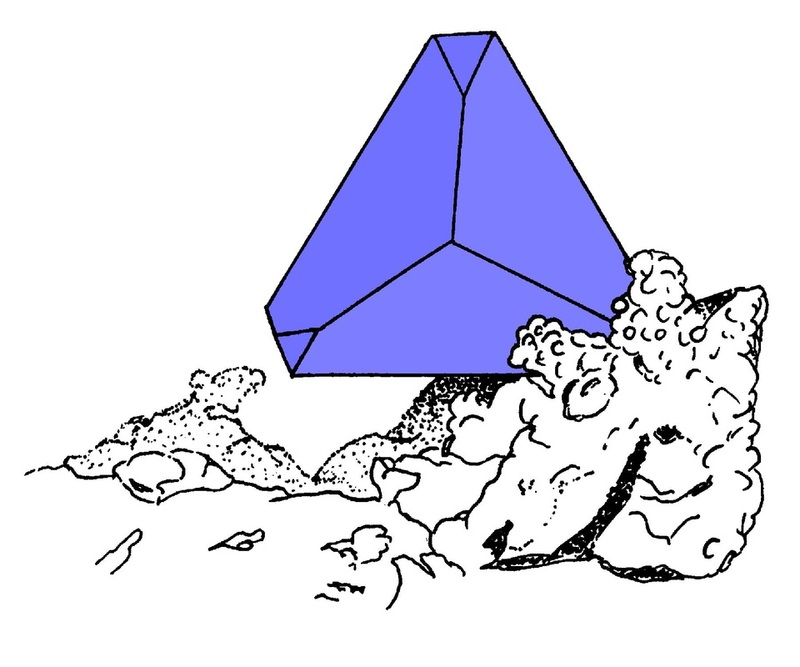 They first thought the crystals were sapphires. He eventually took some crystals to Professor George Louderback at the University of California who studied the crystals carefully and found that this was a mineral that had not been known before. He named the mineral “Benitoite” because the crystals were found in San Benito County. Benitoite is a special mineral for a number of reasons. One reason is that it is the first mineral discovered that belongs to the special crystal class called the (are you ready?!) ditrigonal-dipyramidal class of the hexagonal system. Benitoite is also called one of the most beautiful gemstones. It is easy to cut and looks a lot like sapphire. Benitoite is light to dark blue. In San Benito County it is found in a white mineral called natrolite and usually has other minerals with it like deep red neptunite. Neptunite is so dark that at first look, you may think that it is black. But if you were to see a small chip of neptunite, you would see that it actually a very deep shade of red. Above: Neptunite crystals on natrolite matrix. Neptunite is found with benitoite.